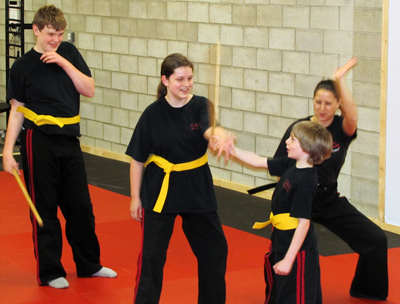 CMATS is a safe, healthy environment for all ages to come and train Modern Arnis. 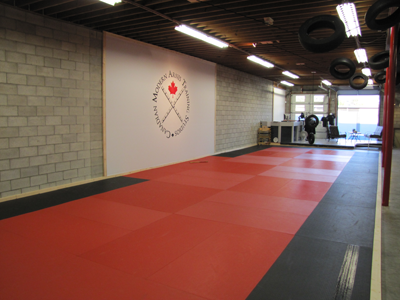 The facility has over 1000 sq/ft of mat space with multiple areas for various types of training. 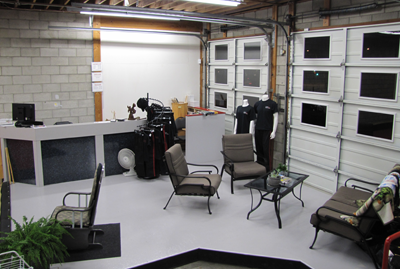 Located within the studio is a kitchen area, small gym section, two washrooms and a retail/front lounge area for parents and observers. The studio is also heated and in the warm summers we open up the 2 bay doors for a cool ocean breeze. 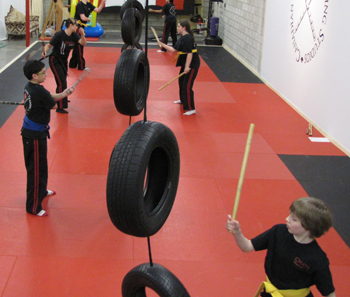 As you can see in the picture to the right, we've mounted tires to the roof that can swing down over the mats for students to work on and after class swing on. By striking the tires critical skills can be worked on such as grip and tip control. Many students have discovered a weakening grip matched with a wild strike can send their stick flying! Additionally, students learn how to move and adjust to targets by setting the tires in motion. This makes for a realistic understanding of unpredictability. At the front of the studio there is a lounge/reception area where students and visitors can relax and enjoy watching a class or chat during non-class hours. In the summer, this is definately the spot to be with the bay doors open, looking out off the deck! 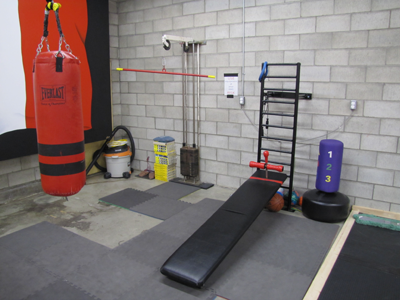 The gym area has a few different types of equipment setup for various training exercises. The heavy bag is there to work on various types of strikes and for some to get a good work out. A situp bench and pull bar with weights are good for muscle toning, wrist strengthening and weight loss. The use of this equipment is included in your monthly fees. The situp bench is adjustable to allow for a tougher or easier workout. The door is always open, so stop on by and check us out!